Irish baby box from Belleek is for baby's first tooth. 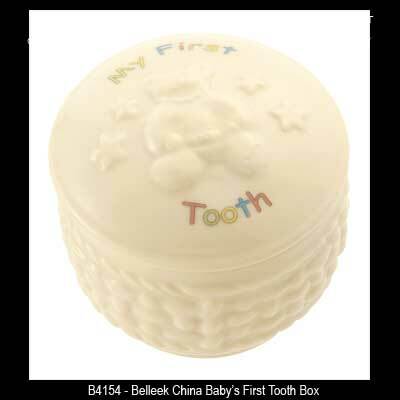 The baby's first tooth box, from Belleek China, was introduced in 2014. Sorry, this Belleek baby gift is out of stock and may or may not return. This Irish baby box from Belleek China is designed to hold baby's first tooth. The baby's first tooth box features the painted words My First Tooth along with an embossed Teddy bear and stars on the lid; the Galway weave pattern embossed on the base. The Belleek baby box measures 1 3/4" wide x 1 3/4" tall and it is hand crafted and hand painted in Belleek, Ireland.